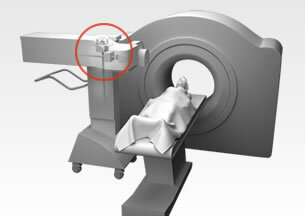 Because lives can literally hang in the balance, precise motion control is incredibly important for medical equipment. These machines may perform a wide array of functions, but no matter what they do, precision is key; even the slightest misalignment could lead to an incorrect diagnosis—or worse. Miki Pulley offers a full line of high precision motion control solutions for medical equipment. In the example above, a Miki Pulley SFC shaft coupling and BXW spring actuated brake are used in a medical imaging system. These devices work together to ensure accurate linear movement and to maintain proper positioning throughout the process. The SFC coupling operates with zero backlash and low inertia, utilizing metal plate springs to provide high torsional rigidity and dampen vibration. A flexible element gap reduces conductive heat transfer between the motor and the output shaft. 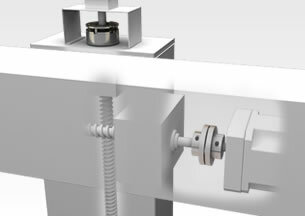 The BXW model brake stops rotation when power is disengaged, and stops linear actuators from back-driving if power unexpectedly fails. Special spring placement minimizes noise caused by high speed vibration, and the BXW’s compact design allows for easy installation and can reduce the equipment’s footprint. Request a quote on shaft couplings, brakes, and other motion control solutions for your medical equipment application. Or, contact Miki Pulley to learn more.